I think this is the third time we’ve played this one. We acquired it at BGG.Con last year. 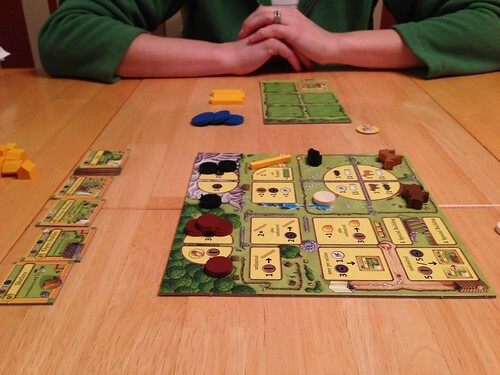 It is a light, fast worker placement game derived from the classic Agricola which is much heavier and more expansive. While Agricola deals with all the aspects of raising/developing a farm, All Creatures Big and Small (ACBAS) is just about raising and keeping the animals. So, I’m going to attempt something ambitious this year. I will write a session report of all our board game plays that we have this year. I normally don’t write these or log my plays on boardgamegeek.com which has an extensive database of just that from thousands of people. I will cross post these there, but my main motivation will simply be to keep track of everything we play. I know this won’t be of much value to anyone who visits our blog, and that’s ok. Our blog is just as much a historical record of our family as much as an information portal for others to the goings-on of the Jeppson clan. Board games have become very important for Jessica and I as a couple. They have moved on from simply a means of entertainment and a way to pass to time. Now, we learn about each other through them. We work together on common goals in some games. We learn how to better engage in conflict with each other. And we simply, well, learn together. Well-designed games will teach you something. Whether it be math, economics, game-theory, or whatever, we are learning together, and that is wonderful. 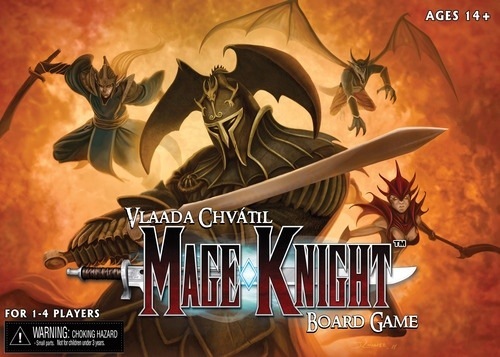 Ok, so our first game of the year was Mage Knight on Jan. 4.